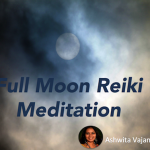 A new moon marks the start of the next moon cycle, signifying death and rebirth. This is a great time for setting intentions. You can sit out in the open if it is possible, or in a sacred space that you have created at home. Begin by taking a few deep breaths. Every time you exhale, imagine that stresses and tensions stored in your body are dissolving and fading away. Now, watch the movement of your belly as you breathe. Do this for some time. Become aware of the empty sky above, and surrender to this emptiness. Imagine that you are sitting in a vast, empty space, and let this emptiness still you. Next, bring in to your awareness, the intentions you wish to manifest. These can be short term as well as long term. Start by drawing the distance healing symbol to connect more deeply with your intention. Visualise your intentions one by one, imagining them turning into seeds at the end. Remember that the short term intention seeds are smaller than the long term ones. When you are done, imagine that you are standing at the shore of an ocean representing the universal energies. Dig a small hole in the ground for every seed, sow it, and water it from the ocean. Seal with the power symbol. Bring your awareness back to your breath and just watch it. When you are done, become aware of the sounds in the background and slowly open your eyes. You can go back to this spot every night and water the plants for quicker manifestation.